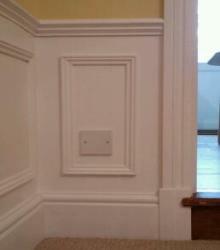 Architrave Plinth blocks are used where the architraves meet the skirting boards. Sometimes called base blocks they were originally installed in large and stately manor style homes when the skirting boards were thicker than the architraves. It's difficult without them to finish that situation neatly and without looking odd, but more often nowadays they are used purely as a decorative feature. Modern skirting boards are rarely thicker than the architrave unless they are built up in layers with lots of mouldings. All I did to make them was rip down a length of 125x32mm planed softwood (door lining timber) so it was 15mm wider than the Ogee architrave I wanted to install. Then use an off cut of the architrave as a guide to mark a bevel on like in the picture. I used an electric planer at an angle to cut the bevel onto the timber. A table saw would of been a whole lot easier but I didn't have one at the time! The bevel is really important because if you just leave them square the base block will prevent the door from opening much more than 90°. After that I simply cut it into lengths slightly taller (about 10mm) than the skirting board and used a block plane to put a small bevel/chamfer on the top edges that don't touch the wall. Sand them up, and then fix in place. To fix them I used gripfill on the back and then pinned them with the Dewalt finish nail-gun. You need to put them fairly close to the edge of the lining with just a small margin because you need another margin from there to the architrave. 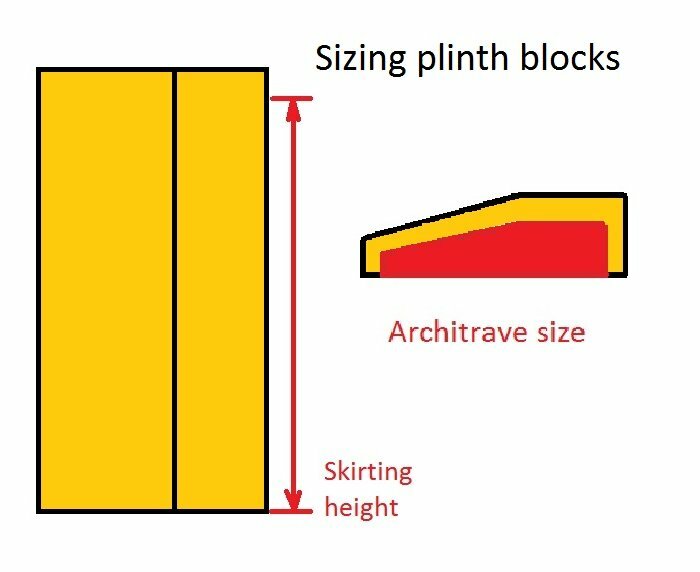 Have a comment or question about making plinth blocks?